He's out of a job, he's out of luck, and now he's.....out of his MIND?! Looks like the notorious ex-politician/movie-star has taken a gig telling fortunes at the carnival. Come stop by and test his powers of prediction! Why pay for psychics when you can have your own personal guide in the palm of your hand? Just ask a yes/no question and let the truth be foretold! Will I get that promotion I've been aiming for? Is the apocalypse really going to happen this year? 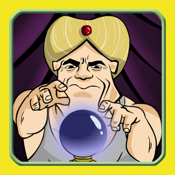 For all your life's curiosities, be sure to consult THE FORTUNATOR!